THE world's largest producer of high-pressure hydraulic tools, Enerpac , will feature its biggest-ever range of maintenance and fabrication presses at AIMEX 2003 next September. Part of the Actuant corporation, which has worldwide sales exceeding $1 billion a year, Enerpac will show presses in capacities from 5-200 tons with complementary air and electric pumps, meters and load cells. In addition to arbor, bench, c-clamp and workshop models, Enerpac presses include the innovative roll-frame press, which avoids the tricky task of placing heavy and awkwardly shaped components into position under a press. Often workpieces have to be extensively manhandled in a time-consuming and potentially hazardous operation that can also expose the component to further damage. 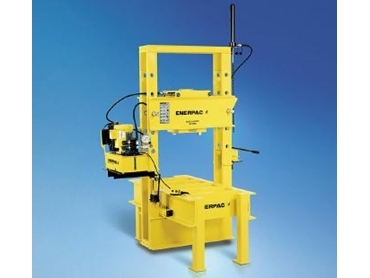 But the Enerpac roll-frame press employs a little lateral thinking: Instead of moving heavy components into place under the press frame, they developed a mobile press frame that could be moved into place above the workpiece. Instead of having the press frame fixed in position above the press bed, like a traditional press, the Enerpac Roll-Frame can travel the entire length of the press bed, so it can be rolled back for loading, then rolled over the workpiece and locked into position at exactly the right place. As well as the frame's longitudinal movement, the hydraulic press cylinder mounted on it can also be moved laterally across the press frame to bear down precisely where it's needed. Meanwhile the Westrac organisation, Caterpillar's exclusive dealership in Western Australia, uses both Enerpac roll-frame and Enerpac H-frame presses to disassemble and reassemble the rear wheel final drives of the trucks, which carry loads of up to 285 tonnes of earth and mineral ores at WA mining sites. Complete strip-downs of the trucks are required about every two years or 12,000 hours, while specific mechanical repairs are also carried out to customer's requirements at Westrac locations including Perth, Kalgoorlie, Bunbury in the south west, and Newman in the Pilbara. The heavy overhauls take place in specialised Westrac workshops that include an engine shop, a transmission shop and a final drive shop. Enerpac high-pressure (700 bar, 10,000psi) hydraulic force comes into play during final drive overhauls, which require disassembly of the rear wheels, brakes, and the planetary gearboxes that produce the low speeds and high torque required by the huge vehicles. The 90-tonne Perth press - one of several Enerpac roll-frames operated in WA by Westrac - was especially modified from a standard Enerpac roll-frame design to accommodate the dimensions of the parts being handled in the workshop. The Enerpac equipment is the same type used by Caterpillar in the US for OEM tasks, and the same type also widely used throughout Australasian and Asian mining, energy, transport and industrial sectors for lifting, forming, pressing, pulling, fabrication, cutting and assembly tasks.